As promised by time-traveling seer Rufus in Bill & Ted's Excellent Adventure, by the year 2688, planet Earth will be a utopia, with clean air, clean water, clean dirt, and many excellent waterslides. And in 2014, we have not only taken one step closer to that future, we have managed to do so without the help of Eddie Van Halen. 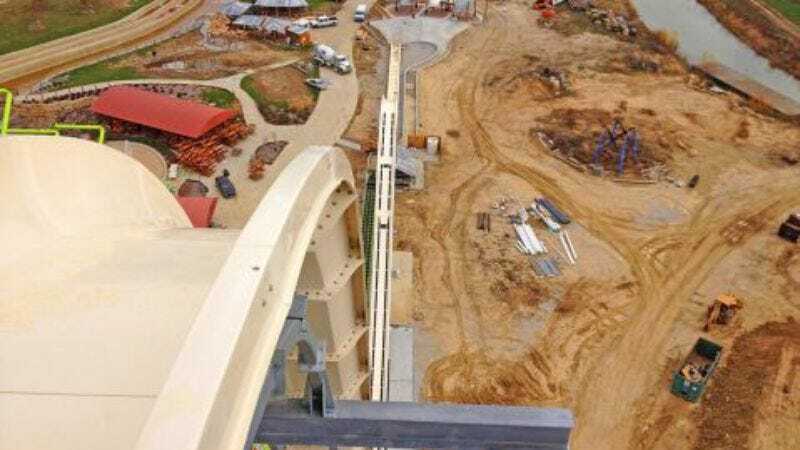 Instead, we have the good people of New Braunfels, Texas, to thank, as a manufacturer in that humble burg have built a waterslide that will make all others feel like Napoleon in comparison: Verrückt, the tallest waterslide in the world. Soon to be installed at Schlitterbahn, a German-themed water park in Kansas City, Verrückt stands nearly 170 feet tall, eclipsing the current record-holder in Rio de Janeiro. The record-breaking slide was constructed from railroad tankers, cut and welded together. Passengers will slide on a raft, as fast as 65 miles per hour, down a track over 600 feet long. And when they do, they'll be sliding not just towards a pool of water, but towards a better future, in which we can all be excellent to each other, and party on, dudes.